In this episode, I’ll talk about dealing with seasonal affective disorder/winter blues. You’ll also hear about one of my Tarot readings. I’ll talk about the uses for Peppermint, and I’m going to give you a prompt, something you can do easily and in a short amount of time, to get some magic into your day. Many people struggle with their emotions and moods during the darker months, feeling anxious, sad, hopeless and having low energy levels. Some call it winter depression, seasonal depression or the winter blues. It doesn’t happen to everyone who lives where it’s dark during the winter, but many enough are affected for it to get a scientific name. It’s officially called Seasonal affective disorder (SAD) and comes from many variables, but one of the main factors is thought to be a lack of exposure to full-spectrum, natural light (sunlight). The reason why some are more sensitive to this than others is a biochemical imbalance in the hypothalamus, a lack of serotonin and melatonin. So how can we fix this, or at least alleviate the symptoms? It’s very important to eat healthy foods to pull out of this. Winter depression might get you to crave carbohydrates and fat. If you’re eating a lot of fat and simple carbohydrates (like sugar), and consuming large amounts of caffeine because you’re tired, your body won’t be able to perform as well. This can also cause the depression to get worse. Seratonin is composed of tryptophan, which is an amino acid found in foods such as fish, turkey, bananas, nuts and avocados. If you’re unable to eat these, Omega3 fatty acids and vitamin D seem to have some effect. Taking a magnesium supplement may alleviate depression in some cases. Vitamin C helps make the hormones adrenaline and cortisone and the neurotransmitter noradrenaline. Vitamin C also aids proper adrenal and thyroid function. Citrus fruits, kiwi and rosehips contain vitamin C, as does White cabbage and Black Currants. A high-sugar diet may inhibit the use of vitamin C and can affect both your immune response and mood, so that’s three more reasons to replace it with longer carbohydrate chains or eliminate it entirely. Fluctuating blood sugar levels is not good when all is well, and even worse when you’re depressed. Don’t skip breakfast, eat 4-5 meals a day and choose slow-release foods to keep them more level. I must admit I’m not very good at cutting out the sugar, but at least I’m trying. I’m not an SAD sufferer, but it’s a good idea to get rid of it anyway. Make sure you get enough sleep but don’t let that be an excuse to sleep the whole day away. Both insomnia and oversleeping are possible symptoms of SAD, but getting enough sleep is crucial to feeling better. Take a walk in the sunlight, go skiing, ice skating, or take a toboggan and ride it down the hill. Any form of exercise helps depression, but combining it with sunlight is even better. There’s nothing wrong with connecting to your inner child either, something that’s a lot easier todo when you have kids. I know it’s a lot harder to get yourself outside during the winter, but you really have to try if you’re going to fix this. Get outside in what little sunlight there is as much as you can. If there isn’t any (i.e. if the sun doesn’t rise in winter), there are full spectrum light bulbs, and special lights made for this. Light therapy (phototherapy) is to sit in front of a lightbox or special lamp that is 10 to 20 times brighter than ordinary indoor lights for approximately 30 minutes each day. Some of these are also good for the digestive system, where a lot of the serotonin is produced. Counselling and cognitive behavioral therapy have helped some of those who aren’t able to cope with this themselves get through the winter months. Only the worst cases need prescription medication, so don’t use it if you don’t need it. There are so many side effects you don’t want to experience. I hope you’re not one of those who suffer from this, but if you are, I hope this episode helps you in some way. A man came to me wanting to find out how he could find the time for his spirituality while running a business. The tarot cards had something to say about that. You may have to change something big when it comes to behavior, thinking, or expectations. You may not like change, but things need to change, and you may also have to compromise. You need to make up your mind about what you really want to do. It may feel selfish to take the time for this, but it isn’t. You know in your heart that you need this, so don’t put it off any longer. Making these changes will give you more energy for business. Make your decisions using your intuition. It isn’t always necessary for others to understand why you need this, as long as you know. Take the time to get your head above water and find out where you are going. A short break or a change of environment can help. Your attention to detail may be getting in the way of the change you need. Try to see the big picture. You may also need to learn some new skills to make this work. Today’s prompt is to start planning your smaller celebrations. Will you be celebrating the full moon? all moon phases? Something else? I sent my last international shipment of the year on Wednesday. So the only ones who can still get deliveries this year are the customers here in Norway. If you want to start your daughter’s new year off in a good way, have a cup of tea with me to see what kind of amulet we can make for her. This is a conversation focusing on finding a solution for you, not a sales call. You will walk away with something, either a recipe to make your own for her, or you may ask me to make it. 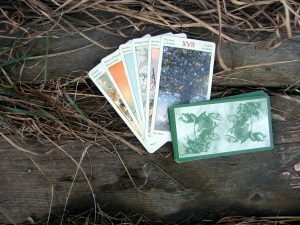 The November readings go away after Monday, so if you want a full sized Tarot reading at a really low investment, you need to act now. That’s it for me for today. Thanks for listening to the Witch in the Valley Podcast. The next episode will, among other things, be about tips for a pagan yule. If you have any questions, just reach out to me at linda@lindaursin.net Remember to rate and subscribe to the podcast on iTunes.